As my time on my healthy hair journey has progressed I've found that deep conditioning is an important step that I was skipping before I started my journey and it was hurting my hair. Now that I've been deep conditioning each week to great results but now I want to take it up a notch. And the Hot Head Microwavable Deep Conditioning Cap can help with that so I made the leap and bought one. "Hot Head is a unique microwavable deep conditioning heat cap created by a professional hair stylist. It offers an easy and stylish way to achieve the results of a salon quality conditioning treatment at home. Each Hot Head is handmade with love, and constructed from quality natural materials." 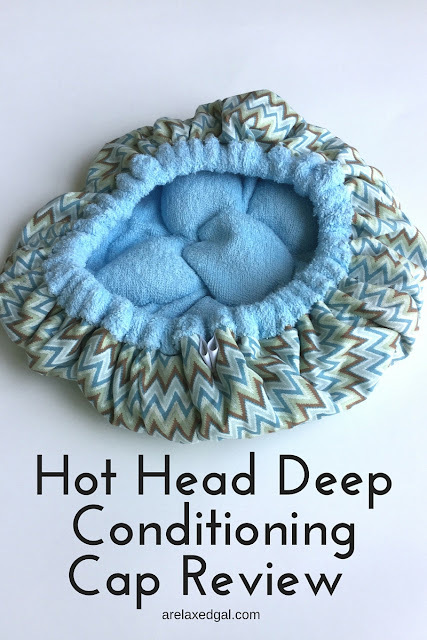 "The Hot Head heat cap is filled with renewable flax seed which will generate heat when warmed in the microwave. It's reusable and is the most environmentally friendly way to deep condition your hair with heat at home. There is no need to plug it into an outlet or use batteries to power the heat." "Heating times are approximate. Microwaves will vary. Always watch closely. Place Hot Head flat on a clean glass or ceramic place, elastic facing up. Heat 2 min at 1,000 watts, flipping inside out at the halfway mark. If microwave is not equipped with rotating plate then rotate and flip by hand every 30 sec. Adjust heat setting or time if needed. If additional heat is needed proceed in 10-20 sec increments flipping inside out and laying flat with elastic facing up each time until desired heat is achieved. Gently towel dry hair before applying conditioner. Place plastic cap completely over conditioner immersed hair. Follow with heated Hot Head. For best results wear 20-45 min. Remove completely and let hair cool for 5 min before rinsing with cold water." "Your Hot Head can be spot cleaned using warm water and a mild detergent. This tends to be sufficient since you will always be wearing a disposable or reusable plastic shower cap as a barrier between the Hot Head and your conditioner immersed hair. If your cap gets a little linty, simply roll over it with a lint roller to make it come clean again." I love this cap! I've used it for my pre-poo deep conditioning and really like how easy it is to use. The greatest benefit of this cap is it allows me to deep condition with heat and not be tied down to one place. The cap gets hot and stays hot for a long time. And due to wearing a plastic cap underneath the Hot Head cap, the heat causes some steaming - bonus! Some things to note are when I first put the Hot Head Deep Conditioning Cap on it felt heavy, but I soon got used to it. Also, I haven't had to clean the cap yet, so I'm not sure how easy, or not, it will be. After using the Hot Head cap consistently for a few weeks my hair felt more moisturized and its manageability increased. I recommend giving this cap a try and see what it does for your hair. I am definitely going to purchase another one when this one wears out. I love my hot head. I got mine for free for the review. I missed out on those influenster gift cards because I was too lazy to write the Ebay buying guides. I almost didn't do the buying guide as well, but I ended up using some info from my blog posts which didn't make them too hard to do. I know it's awesome. Just this past wash day I was able to dust my house and deep condition my hair. Do you use yours each wash day or only occasionally?